For its size, Ireland has some of the greatest geographical diversity of any country in the world. For cyclists, this means a breadth of very different experiences never more than a few hours travel from each other. In recent years, considerable investment has gone into mapping and developing cycle routes in each of the four provinces, and two excellent websites, cycleni.com and cycleireland.ie have collated many of the best rides on the island and illustrated them with directions, maps, photographs and even videos. And maybe, just maybe, you never imagined that the island of Ireland could satisfy your cycling soul. 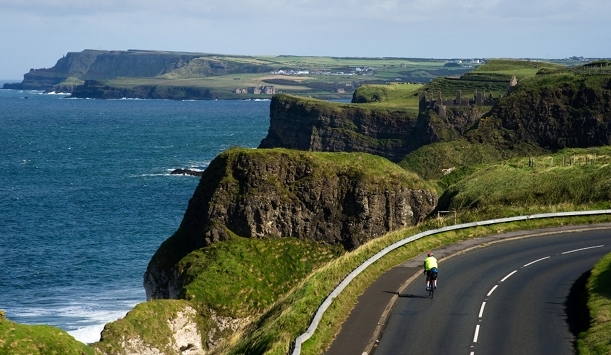 Allow us to suggest some reasons why Ireland may be the biking beauty you’ve been missing. At 300 miles in all, the Kingfisher Trail in the northwest of the island is the longest in Ireland, offering beautiful views at almost every turn. The trail, whose roads straddle the border between Northern Ireland and the Republic of Ireland, consists of landscape dominated by mountains and lakes. In terms of difficulty, cyclists will find plenty of punchy climbs for a tough test or gently winding lanes between villages for those in search of something more modest. The Great Western Greenway (GWG) in County Mayo is predominantly flat, 42 kilometres long and almost traffic-free. Following the route of the old Westport to Achill Island railway line, it hugs the Atlantic Coast along Clew Bay and is one of western Ireland’s most popular walking and cycling routes. Almost entirely off-road, the GWG is particularly attractive to families and leisure cyclists. Hardened road cyclists may be looking for something a little more challenging. Ireland doesn’t offer long Alpine ascents, but it does offer plenty of mountain loops where accumulated hills soon add up to the equivalent climbs. A fine selection for those with the thighs and lungs required to climb steep hills and mountains would include the Mourne Mountains Cycle Loop, 70 kilometres with almost 1,000 metres of climbing and taking in Spelga Dam, Silent Valley and Carlingford Lough; the Rathdrum Wicklow Gap and Dublin route, which is 75 kilometres long with 1,130 metres of climbing past Glendalough and the stunning Wicklow Gap; and the Healy Pass Cycle Loop, with 1,250 metres of climbing over 83 kilometres along the beautiful Beara Peninsula. 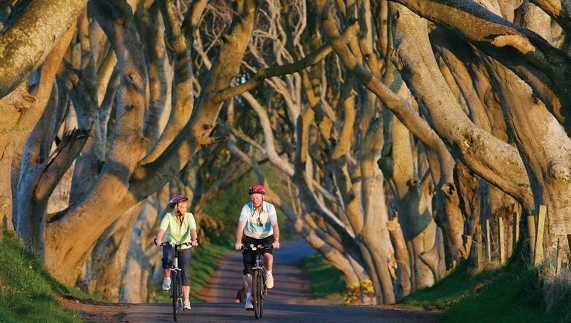 In short, as a cycling destination, Ireland most certainly has something for everyone. And, naturally, our famous hospitality ensures that the après-ride is just as pleasant.